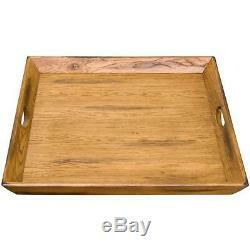 Rustic Square Ottoman Tray in Handmade Brown Oak Wood Extra Large Serving Decor. This is handmade to order item, please note. This extra-large serving tray is big enough to cover your entire ottoman! Perfect for serving guests or lounging with your significant other. To achieve the unique rustic appearance of this collection, each piece of oak is distressed, by darkening and rounding its corners and flattening or indenting its edges, and then treated with a medium-dark brown stain for a high quality finish. The slate inlays feature multiple rich colors that can vary wildly, assuring your piece of furniture will be one-of-a-kind, and are sealed in the wood to prevent cracks and debris. The dimpled knobs and pulls are black hand forged iron, and high quality waterfall glass is used throughout the collection. Some assembly may be required on select Rustic Oak pieces. Instructions and hardware are included where applicable. The item "Rustic Square Ottoman Tray in Handmade Brown Oak Wood Extra Large Serving Decor" is in sale since Friday, June 1, 2018. This item is in the category "Home & Garden\Kitchen, Dining & Bar\Dinnerware & Serving Dishes\Trays". The seller is "thecoolhunter" and is located in Las Vegas, NV.